Includes photos of Kelsey Butler,Casey Feldman, Janine Repka, Melissa Moritz, Kevin Cassidy, Lauren DiCrecchio,Marie Larson,Joe Wack McMenamin,Lindsey Burke,Jim Kennedy,Chris Klaniecki & mom (Dianne Anderson). 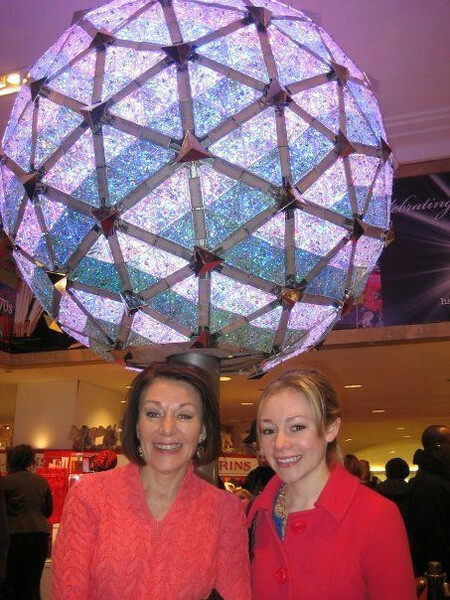 "me and mommy at macy's" - After the end of classes for the 08' semester and during Casey's reaading period I (mom) took the train to NYC to spend the day with Casey doing some Xmas shopping. We had brunch at a diner on 9th Ave., visited the vendors in Central Park (where I bought Casey microwavable slippers to keep her feet warm), bought my pollyanna gift for Aunt Susan with Casey's assistance at Williams Sinoma at the Shops at Columbus Circle and had dinner at a tiny Italian restaurant on 9th Ave. not far from Casey's school. Of course, we also shopped in Macy's, where we had someone take our pic under the ball. We had selected a beautiful necktie for Casey's dad, that another woman tried to grab from me at the counter. I was polite and showed her where there were similar ones. Casey & I laughed about the interchange with the woman who wanted to steal dad's tie!